—କେନ୍ନେଥ୍ ଆଣ୍ଡର୍ସନ୍, ନ’ଟି ନରଖାଦକ ଓ ଏକ ଧୂର୍ତ୍ତ ପୁସ୍ତକ, ଦ୍ୱିତୀୟ ଅଧ୍ୟାୟ - "ଗୁମ୍ମାଲପୁରର ଚିତାଦାଗଯୁକ୍ତ ସୈତାନ"
—ଜିମ୍ କର୍ବେଟ୍, ମନ୍ଦିରର ବାଘ ଓ କୁମାୟୁଁର ଅନ୍ୟ କିଛି ନରଖାଦକ, ଅଧ୍ୟାୟ : "ପାନାର୍ ନରଖାଦକ"
↑ ୧.୦ ୧.୧ Wozencraft, W.C. (2005). "Order Carnivora". In Wilson, D.E. ; Reeder, D.M. Mammal Species of the World: A Taxonomic and Geographic Reference (3rd ed.). Johns Hopkins University Press. p. 547. ISBN 978-0-8018-8221-0. OCLC 62265494. ↑ ୨.୦ ୨.୧ ୨.୨ ୨.୩ ୨.୪ ୨.୫ ୨.୬ ୨.୭ ୨.୮ ୨.୯ "Panthera pardus". IUCN Red List of Threatened Species. Version 2016-3. International Union for Conservation of Nature. 2016. Retrieved 27 August 2016. ↑ Jacobson, Andrew P.; Gerngross, P.; Lemeris Jr., J. R.; Schoonover, R. F.; Anco, C.; Breitenmoser-Würsten, C.; Durant, S. M.; Farhadinia, M. S.; Henschel, P.; Kamler, J. F.; Laguardia, A.; Rostro-García, S.; Stein, A. B.; Dollar, L. (2016). "Leopard (Panthera pardus) status, distribution, and the research efforts across its range". PeerJ. 4: e1974. doi:10.7717/peerj.1974. PMC 4861552. PMID 27168983. ↑ ୫.୦ ୫.୧ Williams, S. T.; Williams, Kathryn S.; Lewis, B. P.; Hill, Russell A. (2017). "Population dynamics and threats to an apex predator outside protected areas: implications for carnivore management". Royal Society Open Science. 4 (4): 161090. doi:10.1098/rsos.161090. PMC 5414262. PMID 28484625. ↑ Bergin, D.; Nijman, V. (2015). "Potential benefits of impending Moroccan wildlife trade laws, a case study in carnivore skins". Biodiversity and Conservation. 25 (1): 199–201. doi:10.1007/s10531-015-1042-1. ISSN 0960-3115. ↑ Ghezzo, E.; Rook, L. (2015). "The remarkable Panthera pardus (Felidae, Mammalia) record from Equi (Massa, Italy): taphonomy, morphology, and paleoecology". Quaternary Science Reviews. 110 (110): 131–151. doi:10.1016/j.quascirev.2014.12.020. ↑ ୧୧.୦ ୧୧.୧ "leopard". Merriam-Webster Dictionary. Retrieved 23 March 2016. ↑ Partridge, Eric (1983). Origins: A Short Etymological Dictionary of Modern English. New York: Greenwich House. p. 349. ISBN 978-0-517-41425-5. ↑ ୧୩.୦ ୧୩.୧ Monier-Williams, M. (2005). A Sanskrit-English Dictionary: Etymologically and Philologically Arranged. Motilal Baransidas Publishers. ISBN 978-81-208-3105-6. ↑ ୧୪.୦ ୧୪.୧ ୧୪.୨ ୧୪.୩ ୧୪.୪ ୧୪.୫ ୧୪.୬ ୧୪.୭ Stein, A.B. ; Hayssen, V. (2010). "Panthera pardus (Carnivora: Felidae)" (PDF). Mammalian Species. 45 (900): 30–48. doi:10.1644/900.1. Archived from the original (PDF) on 2016-03-05. ↑ ୧୫.୦ ୧୫.୧ "panther". Merriam-Webster Dictionary. Retrieved 3 April 2010. ↑ ଛାଞ୍ଚ:OED OED gives examples of "pard" from OE until 1984. ↑ ୧୭.୦ ୧୭.୧ Partridge, Eric (1983). Origins: A Short Etymological Dictionary of Modern English. New York: Greenwich House. p. 467. ISBN 978-0-517-41425-5. ↑ ୧୮.୦ ୧୮.୧ ୧୮.୨ Johnson, W.E. ; Eizirik, E.; Pecon-Slattery, J.; Murphy, W.J. ; Antunes, A.; Teeling, E.; O'Brien, S.J. (2006). "The late Miocene radiation of modern Felidae: a genetic assessment". Science. 311 (5757): 73–77. Bibcode:2006Sci...311...73J. doi:10.1126/science.1122277. PMID 16400146. ↑ ୧୯.୦ ୧୯.୧ Werdelin, L.; Yamaguchi, N.; Johnson, W.E. ; O'Brien, S.J. (2010). 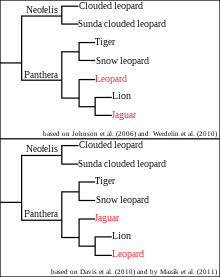 "Phylogeny and evolution of cats (Felidae)" (PDF). Biology and Conservation of Wild Felids: 59–82. ↑ ୨୦.୦ ୨୦.୧ ୨୦.୨ Davis, B.W. ; Li, G.; Murphy, W.J. (2010). "Supermatrix and species tree methods resolve phylogenetic relationships within the big cats, Panthera (Carnivora: Felidae)" (PDF). Molecular Phylogenetics and Evolution. 56 (1): 64–76. doi:10.1016/j.ympev.2010.01.036. PMID 20138224. Archived from the original (PDF) on 2016-03-05. ↑ ୨୧.୦ ୨୧.୧ ୨୧.୨ Mazák, J.H. ; Christiansen, P.; Kitchener, A.C.; Goswami, A. (2011). "Oldest known pantherine skull and evolution of the tiger". PLoS ONE. 6 (10): e25483. Bibcode:2011PLoSO...625483M. doi:10.1371/journal.pone.0025483. PMC 3189913. PMID 22016768. ↑ Ellerman, J. R.; Morrison-Scott, T. C. S. (1966). Checklist of Palaearctic and Indian mammals 1758 to 1946 (2nd ed.). London: British Museum of Natural History. pp. 315–317. ↑ Pocock, R.I. (1939). "Panthera pardus". The Fauna of British India, Including Ceylon and Burma. Mammalia: Volume 1. London: Taylor and Francis. pp. 222–239. ↑ Miththapala, S.; Seidensticker, J.; O'Brien, S. J. (1996). "Phylogeographic subspecies recognition in leopards (Panthera pardus): molecular genetic variation" (PDF). Conservation Biology. 10 (4): 1115–1132. doi:10.1046/j.1523-1739.1996.10041115.x. ↑ ୨୭.୦ ୨୭.୧ ୨୭.୨ ୨୭.୩ Uphyrkina, O.; Johnson, E.W. ; Quigley, H.; Miquelle, D.; Marker, L.; Bush, M.; O'Brien, S. J. (2001). "Phylogenetics, genome diversity and origin of modern leopard, Panthera pardus" (PDF). Molecular Ecology. 10 (11): 2617–2633. doi:10.1046/j.0962-1083.2001.01350.x. PMID 11883877. ↑ ୨୮.୦ ୨୮.୧ Khorozyan, I. G.; Gennady, F.; Baryshnikov, G. F.; Abramov, A. V. (2006). "Taxonomic status of the leopard, Panthera pardus (Carnivora, Felidae) in the Caucasus and adjacent areas" (PDF). Russian Journal of Theriology. 5 (1): 41–52. Archived from the original (PDF) on 2016-03-03. ↑ ୩୧.୦ ୩୧.୧ Dou, H., Feng, L., Xiao, W., & Wang, T. (2014). The complete mitochondrial genome of the North Chinese Leopard (Panthera pardus japonensis). Mitochondrial DNA: 1-2. ↑ Heptner, V.G. Heptner (1992). Mammals of the Soviet Union. Leiden: Brill. p. 61. ISBN 978-90-04-08876-4. ↑ Tanomtong, A.; Khunsook, S.; Keawmad, P.; Pintong, K. (2008). "Cytogenetic study of the leopard, Panthera pardus (Carnivora, Felidae) by conventional staining, G-banding and high-resolution staining technique" (PDF). Cytologia. 73 (1): 81–90. doi:10.1508/cytologia.73.81. ↑ Turner, A. (1987). "New fossil carnivore remains from the Sterkfontein hominid site (Mammalia: Carnivora)". Annals of the Transvaal Museum. 34: 319–47. ↑ Bininda-Emonds, O.R.P. ; Decker-Flum, D.M. ; Gittleman, J.L. (2001). "The utility of chemical signals as phylogenetic characters: an example from the Felidae" (PDF). Biological Journal of the Linnean Society. 72 (1): 1–15. doi:10.1111/j.1095-8312.2001.tb01297.x. Archived from the original (PDF) on 2010-01-31. Retrieved 2008-06-07. ↑ Marciszak, A.; Stefaniak, K. (2010). "Two forms of cave lion: Middle Pleistocene Panthera spelaea fossilis Reichenau, 1906 and Upper Pleistocene Panthera spelaea spelaea Goldfuss, 1810 from the Bísnik Cave, Poland". Neues Jahrbuch für Geologie und Paläontologie - Abhandlungen. 258 (3): 339–351. doi:10.1127/0077-7749/2010/0117. ISSN 0077-7749. ↑ Diedrich, C.G. (2013). "Late Pleistocene leopards across Europe – northernmost European German population, highest elevated records in the Swiss Alps, complete skeletons in the Bosnia Herzegowina Dinarids and comparison to the Ice Age cave art". Quaternary Science Reviews. 76: 167–193. Bibcode:2013QSRv...76..167D. doi:10.1016/j.quascirev.2013.05.009. ↑ Kisling, V.N., ed. (2001). Zoo and Aquarium History : Ancient Animal Collections to Zoological Gardens. Boca Raton, Florida (USA): CRC Press. p. 314. ISBN 978-0-8493-2100-9. ↑ Eberhart, G. M. (2002). Mysterious Creatures : A Guide to Cryptozoology. Oxford, UK: ABC-Clio. pp. 514–516. ISBN 978-1-57607-283-7. ↑ "Geocites – Liger & Tigon Info". Archived from the original on October 15, 2007. Retrieved June 9, 2008. ↑ ୪୨.୦ ୪୨.୧ ୪୨.୨ Hoath, R. (2009). Field Guide to the Mammals of Egypt. Cairo, Egypt: American University in Cairo Press. pp. 106–107. ISBN 978-977-416-254-1. ↑ ୪୩.୦ ୪୩.୧ Schütze, H. (2002). Field Guide to the Mammals of the Kruger National Park. Cape Town, South Africa: Struik Publishers. pp. 92–3. ISBN 978-1-86872-594-6. ↑ ୪୪.୦ ୪୪.୧ Skinner, J.D. ; Chimimba, C.T. (2005). The Mammals of the Southern African Subregion (3rd ed.). Cambridge, UK: Cambridge University Press. pp. 397–401. ISBN 978-0-521-84418-5. ↑ Menon, V. (2014). Indian Mammals: A Field Guide. Gurgaon, India: Hachette India. ISBN 978-93-5009-761-8. ↑ ୪୬.୦ ୪୬.୧ ୪୬.୨ ୪୬.୩ ୪୬.୪ ୪୬.୫ ୪୬.୬ ୪୬.୭ ୪୬.୮ ୪୬.୯ Estes, R. (1991). The Behavior Guide to African Mammals, Including Hoofed Mammals, Carnivores, Primates. Los Angeles: The University of California Press. ISBN 978-0-520-08085-0. ↑ ୪୭.୦ ୪୭.୧ ୪୭.୨ ୪୭.୩ ୪୭.୪ Nowak, R.M. (1999). Walker's Mammals of the World (6th ed.). Baltimore, USA: Johns Hopkins University Press. pp. 828–31. ISBN 978-0-8018-5789-8. ↑ Brakefield, T. (1993). "Leopard: The Super Cat?". Big Cats: Kingdom of Might. ISBN 978-0-89658-329-0. ↑ Times of India (2016). "Is this the longest leopard in India?". Bennett, Coleman & Co. Ltd.
↑ The Tribune (2016). "Leopard shot in Bilaspur turns out to be a record breaker". The Tribune Trust. ↑ Burnie, D.; Wilson, D.E., eds. (2001). Animal: The Definitive Visual Guide to the World's Wildlife. DK Adult. ISBN 978-0-7894-7764-4. ↑ Brain, C.K. (1983). The Hunter or the Hunted: An Introduction to African Cave Taphonomy. University of Chicago Press. ISBN 978-0-226-07090-2. ↑ Foley, C.; Foley, L.; Lobora, A.; De Luca, D.; Msuha, M.; Davenport, T.R.B. ; Durant, S.M. (2014). A Field Guide to the Larger Mammals of Tanzania. Princeton, USA: Princeton University Press. pp. 132–3. ISBN 978-1-4008-5280-2. ↑ Mivart, St. G.J. (1900). The Cat: An Introduction to the Study of Backboned Animals, Especially Mammals. London, UK: John Murray. pp. 427–429. ↑ Francis, C.M. (2008). A Field Guide to the Mammals of Southeast Asia. London, UK: New Holland. p. 296. ISBN 978-1-84537-735-9. ↑ Gamble, C.; Griffiths, R. (2004). Leopards: Natural History and Conservation. Voyageur Press. ISBN 978-0-89658-656-7. ↑ Eizirik, E.; Yuhki, N.; Johnson, W.E. ; Menotti-Raymond, M.; Hannah, S.S.; O'Brien, S.J. (2003). "Molecular genetics and evolution of melanism in the cat family" (PDF). Current Biology. 13 (5): 448–53. doi:10.1016/S0960-9822(03)00128-3. PMID 12620197. Archived from the original (PDF) on 6 May 2013. ↑ Robinson, R. (1970). "Inheritance of the black form of the leopard Panthera pardus". Genetica. 41 (1): 190–7. doi:10.1007/BF00958904. PMID 5480762. ↑ Searle, A.G. (1968). Comparative Genetics of Coat Colour in Mammals. London: Logos Press. ↑ Kawanishi, K.; Sunquist, M. E.; Eizirik, E.; Lynam, A. J.; Ngoprasert, D.; Wan Shahruddin, W. N.; Rayan, D. M.; Sharma, D. S. K.; Steinmetz, R. (2010). "Near fixation of melanism in leopards of the Malay Peninsula". Journal of Zoology. 282 (3): 201–206. doi:10.1111/j.1469-7998.2010.00731.x. ↑ Sunquist, F. (2007). "Malaysian Mystery Leopards". National Wildlife Magazine. 45 (1). Archived from the original on 2008-01-16. ↑ Shuker, K.P.N. (2003). The Beasts that Hide from Man : Seeking the World's Last Undiscovered Animals. New York, USA: Paraview Press. p. 273. ISBN 978-1-931044-64-6. ↑ ୬୩.୦ ୬୩.୧ Pirie, Tara J.; Thomas, Rebecca L.; Fellowes, Mark D. E. (2016-05-20). "Erythristic leopards Panthera pardus in South Africa". Bothalia (in ଇଂରାଜୀ). 46 (1): 5 pages. doi:10.4102/abc.v46i1.2034. ISSN 2311-9284. ↑ ""Strawberry" Leopard Discovered—A First". National Geographic Society. 2012. ↑ Murphey, Rhoads (1951). "The Decline of North Africa Since the Roman Occupation: Climatic or Human?" (PDF). Annals of the Association of American Geographers. XLI (2): 116–132. doi:10.1080/00045605109352048. ↑ Pirie, Tara J.; Thomas, Rebecca L.; Fellowes, Mark D.E. (2017-05-30). "Increasing game prices may alter farmers' behaviours towards leopards (Panthera pardus) and other carnivores in South Africa". PeerJ (in ଇଂରାଜୀ). 5: e3369. doi:10.7717/peerj.3369. ISSN 2167-8359. ↑ ୬୭.୦ ୬୭.୧ ୬୭.୨ Gavashelishvili, A.; Lukarevskiy, V. (2008). "Modelling the habitat requirements of leopard Panthera pardus in west and central Asia". Journal of Applied Ecology. 45 (2): 579–588. doi:10.1111/j.1365-2664.2007.01432.x. ↑ Schaller, G.B. (1972). The Serengeti Lion: A Study of Predator-Prey Relations. Chicago, USA: University of Chicago Press. ISBN 978-0-226-73639-6. ↑ Hunter, L.; Balme, G.; Walker, C.; Pretorius, K.; Rosenberg, K. (2003). "The landscape ecology of leopards (Panthera pardus) in northern KwaZulu-Natal, South Africa: a preliminary project report" (PDF). Ecological Journal. 5: 24–30. Archived from the original (PDF) on February 13, 2010. ↑ Spalton, J.A. ; al Hikmani, H.M.; Willis, D.; Said, A.S.B. (2006). "Critically endangered Arabian leopards Panthera pardus nimr persist in the Jabal Samhan Nature Reserve, Oman". Oryx. 40 (3): 287–94. doi:10.1017/S0030605306000743. ↑ Jenny, D.; Zuberbuhler, K. (2005). "Hunting behaviour in west African forest leopards" (PDF). African Journal of Ecology. 43 (3): 197–200. doi:10.1111/j.1365-2028.2005.00565.x. ↑ ୭୪.୦ ୭୪.୧ "Leopard (Panthera pardus); Physical characteristics and distribution". Comparative Mammalian Brain Collections. ↑ "Animal bytes – Panthera pardus". Sea World. Archived from the original on 24 June 2008. Retrieved 6 June 2008. ↑ ୭୬.୦ ୭୬.୧ ୭୬.୨ "Animal bytes: Leopard". Zoological Society of San Diego. Retrieved 13 February 2010. ↑ Kingdon, J.; Happold, D.; Butynski, T.; Hoffmann, M.; Happold, M.; Kalina, J. (2013). Mammals of Africa. London: Bloomsbury Publishing. pp. 159–68. ISBN 978-1-4081-8996-2. ↑ Pirie, Tara J.; Thomas, Rebecca L.; Reilly, Brian K.; Fellowes, Mark D. E. (2014-12-01). "Social interactions between a male leopard (Panthera pardus) and two generations of his offspring". African Journal of Ecology (in ଇଂରାଜୀ). 52 (4): 574–576. doi:10.1111/aje.12154. ISSN 1365-2028. ↑ Hunter, L.; Balme, G.; Walker, C.; Pretorius, K.; Rosenberg, K. (2003). "The landscape ecology of leopards (Panthera pardus) in northern KwaZulu-Natal, South Africa: A preliminary project report" (PDF). Ecological Journal. 5: 24–30. Archived from the original (PDF) on 2010-02-13. ↑ ୮୦.୦ ୮୦.୧ Steyn, V.; Funston, P.J. (2006). "A case of cannibalism in leopards" (PDF). South African Journal of Wildlife Research. 36 (2): 189–90. ↑ Bodendorfer, T.; Hoppe-Dominik, B.; Fischer, F.; Linsenmair, K.E. (2006). 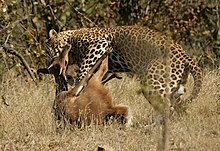 "Prey of the leopard (Panthera pardus) and the lion (Panthera leo) in the Comoé and Marahoué National Parks, Côte d'Ivoire, West Africa". Mammalia. 70 (3/4): 231–46. doi:10.1515/MAMM.2006.037. ↑ Sunquist, Mel; Sunquist, Fiona (2002). Wild Cats of the World. University of Chicago Press. p. 423. ISBN 978-0-226-77999-7. ↑ Jenny, D. (1996). "Spatial organization of leopards Panthera pardus in Tai National Park, Ivory Coast: Is rainforest habitat a "tropical haven"?". Journal of Zoology. 240 (3): 427–440. doi:10.1111/j.1469-7998.1996.tb05296.x. Archived from the original on 2007-10-11. ↑ Marker, L.L. ; Dickman, A.J. (2005). "Factors affecting leopard (Panthera pardus) spatial ecology, with particular reference to Namibian farmlands" (PDF). South African Journal of Wildlife Research. 35 (2): 105–15. ↑ Mizutani, F.; Jewell, P. A. (1998). "Home-range and movements of leopards (Panthera pardus) on a livestock ranch in Kenya". Journal of Zoology. 244 (2): 269–286. doi:10.1017/S0952836998002118. ↑ Bertram, B.C.R. (1982). "Leopard ecology as studied by radio tracking". Symposia of the Zoological Society of London. 49: 341–52. ↑ Stander, P.E. ; Haden, P.J. ; Kaqece, II. ; Ghau, II. (1997). "The ecology of asociality in Namibian leopards". Journal of Zoology. 242 (2): 343–64. doi:10.1111/j.1469-7998.1997.tb05806.x. ↑ Odden, M.; Wegge, P. (2005). "Spacing and activity patterns of leopards Panthera pardus in the Royal Bardia National Park, Nepal" (PDF). Wildlife Biology. 11 (2): 145–52. doi:10.2981/0909-6396(2005)11[145:SAAPOL]2.0.CO;2. Archived from the original (PDF) on 2011-07-28. ↑ Mills, M.G.L. ; Hes, L. (1997). The Complete Book of Southern African Mammals. Cape Town, South Africa: Struik Publishers. pp. 178–180. ISBN 978-0-947430-55-9. ↑ ୯୦.୦ ୯୦.୧ Hamilton, P.H. (1976). The movements of leopards in Tsavo National Park, Kenya, as determined by radio-tracking (M.Sc. thesis). Nairobi: University of Nairobi. ↑ Hayward, M.W. ; Henschel, P.; O'Brien, J.; Hofmeyr, M.; Balme, G.; Kerley, G.I.H. (2006). "Prey preferences of the leopard (Panthera pardus)" (PDF). Journal of Zoology. 270: 298–313. doi:10.1111/j.1469-7998.2006.00139.x. ↑ Scheepers, J.L. ; Gilchrist, D. (1991). "Leopard predation on giraffe calves in the Etosha National Park" (PDF). Madoqua. 18 (1): 49. ↑ ୯୩.୦ ୯୩.୧ Sunquist, M.E. ; Sunquist, F. (2002). "Leopard". Wild Cats of the World. Chicago: University of Chicago Press. pp. 325–342. ISBN 978-0-226-77999-7. ↑ ୯୪.୦ ୯୪.୧ Schaller, G. (1972). Serengeti: a kingdom of predators. New York: Knopf. ISBN 978-0-394-47242-3. ↑ Zuberbühler, K.; Jenny, D. (2002). "Leopard predation and primate evolution". Journal of Human Evolution. 43 (6): 873–886. doi:10.1006/jhev.2002.0605. PMID 12473487. ↑ Arivazhagan, C.; Arumugam, R.; Thiyagesan, K. (2007). "Food habits of leopard (Panthera pardus fusca), dhole (Cuon alpinus) and striped hyena (Hyaena hyaena) in a tropical dry thorn forest of southern India" (PDF). Journal of the Bombay National Historical Society. 104 (2). Archived from the original (PDF) on 4 March 2009. ↑ Johnson K. G.; Wei W.; Reid D. G.; Jinchu H. (1993). "Food habits of Asiatic leopards (Panthera pardus fusca) in Wolong Reserve, Sichuan, China". Journal of Mammalogy. 74 (3): 646–650. doi:10.2307/1382285. JSTOR 1382285. ↑ ୯୮.୦ ୯୮.୧ Bailey, T.N. (1993). The African leopard: a study of the ecology and behaviour of a solitary felid. New York, US: Columbia University Press. ISBN 978-1-932846-11-9. ↑ Bothma, J. du P. (2005). "Water-use by southern Kalahari leopards" (PDF). South African Journal of Wildlife Research. 35: 131–137. ↑ Servheen, C.; Herrero, S.; Peyton, B. (1999). Bears: Status Survey and Conservation Action Plan (PDF). Missoula, Montana: IUCN/SSC Bear Specialist Group. ISBN 978-2-8317-0462-3. ↑ ୧୦୪.୦ ୧୦୪.୧ Harihar, Abishek; Pandav, Bivash; Goyal, Surendra P (2011). "Responses of leopard Panthera pardus to the recovery of a tiger Panthera tigris population". Journal of Applied Ecology. 48 (3): 806–814. doi:10.1111/j.1365-2664.2011.01981.x. ↑ Seidensticker, J. (1976). "On the ecological separation between tigers and leopards" (PDF). Biotropica. 8 (4): 225–234. doi:10.2307/2989714. JSTOR 2989714. ↑ ୧୦୭.୦ ୧୦୭.୧ Seidensticker, J (1976). "On the ecological separation between tigers and leopards" (PDF). Biotropica. 8: 232. doi:10.2307/2989714. JSTOR 2989714. ↑ Karanth, K. U.; Sunquist, M. E. (1995). "Prey selection by tiger, leopard and dhole in tropical forests". Journal of Animal Ecology. 64 (4): 439–450. doi:10.2307/5647. JSTOR 5647. ↑ Karanth, U. K.; Sunquist, M. E. (2000). "Behavioural correlates of predation by tiger (Panthera tigris), leopard (Panthera pardus) and dhole (Cuon alpinus) in Nagarahole, India". Journal of Zoology. 250 (2): 255–265. doi:10.1111/j.1469-7998.2000.tb01076.x. ↑ Heptner, V. G.; Sludskii, A. A. (1992) . "Bars (leopard)". Mlekopitajuščie Sovetskogo Soiuza. Moskva: Vysšaia Škola [Mammals of the Soviet Union, Volume II, Part 2]. Washington DC: Smithsonian Institution and the National Science Foundation. pp. 203–273. ISBN 90-04-08876-8. ↑ "Nile Crocodile". Crocodilian Species List. ↑ Bailey, T. N. (1993). The African leopard: ecology and behavior of a solitary felid. Columbia University Press. ↑ Kingdon, J., Happold, D., Butynski, T., Hoffmann, M., Happold, M., & Kalina, J. (2013). Mammals of Africa. Volume V. London, New Delhi, New York, Sydney: Bloomsbury. ↑ Owens, M.; Owens, D. (1984). Cry of the Kalahari. Boston: Houghton Mifflin. ISBN 978-0-395-32214-7. ↑ Owens, D.; Owens, M. (February 1980). "Hyenas of the Kalahari". Natural History. 89 (2): 50. ↑ Gower, D.; Garrett, K.; Stafford, P. (2012). Snakes. Firefly Books. p. 60. ISBN 978-1-55407-802-8. ↑ Perowne, J. (2014). Blog: Leopard kills cheetah in the Mara and hoists it up a tree. The Safari Collection, Nairobi. 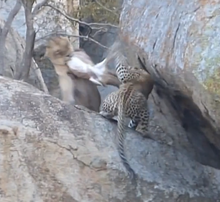 ↑ Leopard left for dead by baboon troop. wilderness-safaris.com (2006-10-25). Archived 2011-09-27 at the Wayback Machine. ↑ Making a Last Stand Counterattack and Chutzpah Living Primates Archived 2012-03-30 at Archive.is. Intechinc.com (19 August 2011). Retrieved on 2011-09-27. ↑ Sadleir, R. (1966). "Notes on the Reproduction of the larger Felidae". International Zoo Yearbook. 6: 184–87. doi:10.1111/j.1748-1090.1966.tb01746.x. ↑ Hemmer, H. (1976). "Gestation period and postnatal development in felids". In Eaton, R.L. The world's cats. 3. Carnivore Research Institute, Univ. Washington, Seattle. pp. 143–165. ↑ Eaton, R.L. (1977). "Reproductive biology of the leopard". Zoologischer Garten. 47 (5): 329–351. ↑ "Leopard: The Spotted Cat". animals.about.com. ↑ "Nie ma już lampartów cejlońskich w warszawskim zoo ..." 15 December 2010. ↑ "Co w zoo? – wtorkowy raport aktualności". 30 March 2010. ↑ "Benin: an African kingdom" (PDF). British Museum. Retrieved 2016-03-29. ↑ Strickland, Debra Higgs; Debra Hassig (1999). The Mark of the Beast: The Medieval Bestiary in Art, Life, and Literature. Taylor & Francis. ISBN 978-0-8153-2952-7. ↑ Pedersen, Christian Fagd (1971). The International Flag Book in Color. Morrow. ↑ Owen, James (November 3, 2005). "Medieval Lion Skulls Reveal Secrets of Tower of London 'Zoo'". National Geographic Magazine. National Geographic. Retrieved 2007-09-05. ↑ Wines, M. (2004). "In South Africa, It's All in the Game". The New York Times. Retrieved 6 February 2015. ↑ Weerasinghe, U.M.I.R.K., Kariyawasm, D. and M. De Zoysa (2003). Ruhuna (Yala) National Park in Sri Lanka: Visitors, Visitation, and Eco-Tourism. Contribution to the XII World Forestry Congress, Quebec. ↑ Kunzru, Hari (8 May 2015). "Life Among the Leopards" – via NYTimes.com. ↑ Capstick, Peter Hathaway (1978). Death in the Long Grass. St. Martin's Press. ISBN 978-0-312-18613-5. ↑ Anderson, Kenneth (1954). Nine Man-Eaters and one Rogue. Allen & Unwin. Allsen, Thomas T. (2007). "Natural History and Cultural History: The Circulation of Hunting Leopards in Eurasia, Seventh-Seventeenth Centuries". In Mair, Victor H. Contact and Exchange in the Ancient World. Honolulu: University of Hawai'i Press. ISBN 978-0-8248-2884-4.
von Jaffa, N. A. K.; Taher, N.A.B. A. (2005). "The Arabian Leopard (Panthera pardus nimr)". Gazelle: the Palestinian Biological Bulletin (42): 1–8. von Jaffa, N. A. K.; Taher, N.A.B. A. (2006). "The Chinese leopard (Panthera pardus japonensis, Gray 1862) in Neunkirchen Zoo, Neunkirchen, Saarland, Germany". Gazelle: the Palestinian Biological Bulletin (60): 1–10.